In reviewing Android Nougat, it became distinctly clear that many of the features are reserved for users of new devices. Initially, it should be considered as a limited update but to be honest, it is by no means the update we've been waiting for. The good features are only available on new smartphones and the best ones only on the Pixel. The Nougat update is yawn-inducingly boring for existing devices. I had registered my Nexus 6P quite early on to get the Nougat preview and I kept an eye on the system as it was developing. Now I have it and I'm a little disappointed. The number of innovations is negligible and the really cool parts are reserved for new devices like the absurdly overpriced Pixel. I'm talking about the seamless updates, the file-based encryption for fast booting and especially the helpful AI-powered Assistant system feature (file-based encryption can be activated later but then you have to delete everything, which seems a bit reasonable). In our Nougat review, all you'll get to see are the expandable notifications, sliding quick-start tiles, multi-window and the most boring Easter Egg since Gingerbread. The features are nice but many users are already familiar with them because LG and Samsung already incorporated them into their top devices a long time ago, before Android boss Hiroshi Lockheimer finally transferred them to the Android core. I want to have the infamous Assistant! For indiscernible reasons, Google Nexus users such as myself have been made into second class customers for this Nougat update. A version behind, we only see the tail lights of the Pixel devices. The Pixel devices already have Android 7.1, while we still persevere with 7.0. Google has created a two-Nougat society. These come with all of the cool safety features that Nougat can offer – in theory. The Assistant will, little by little, become a killer feature, as it ultimately and increasingly becomes the interface between your voice and the digital world that is spreading through your household. Finally, when the last non-connected refrigerator finally gets an Internet connection, the functional scope of the Assistant will be understood: your kitchen will then automatically write your shopping list and immediately ask if you want to order the missing ingredients. Granted, the Assistant is still quite stupid and is little better than its predecessor, Google Now. Beyond appointments, reminders, app calls and reserving tables in restaurants, there's not much else. But more is on the way, I'm sure. AI-supported chatbot agents like Assistant, as well as "Alexa, Siri and [Facebook] M will create the first trillion-dollar company" – according to a recent Venture Beat headline. These agents are considered one of the greatest things this year: the Huffington Post, Business Insider and even the Economist are in agreement on this topic. It's also logical: there's a lot of money in user data and the targeted linking of buyers to sellers. Why Google has excluded old customers – like me, a Nexus-user – from this important innovation step is completely beyond me. We only receive AI through a keyhole and have to chat with the Assistant via Allo, the largely worthless 137th chat app that is not fun at all and makes no sense due to the high number of competing apps. This especially doesn't make sense if one can simply download Microsoft's voice-controlled alternative, Cortana, from the Play Store. With Cortana, you have many of the Assistant's functions, you can network your Windows computer intelligently with a smartphone and Microsoft achieves something else entirely: the AI is trained, it gets to know you a little more closely and feeds the servers with data. OK Google, give me the Pixel Launcher! 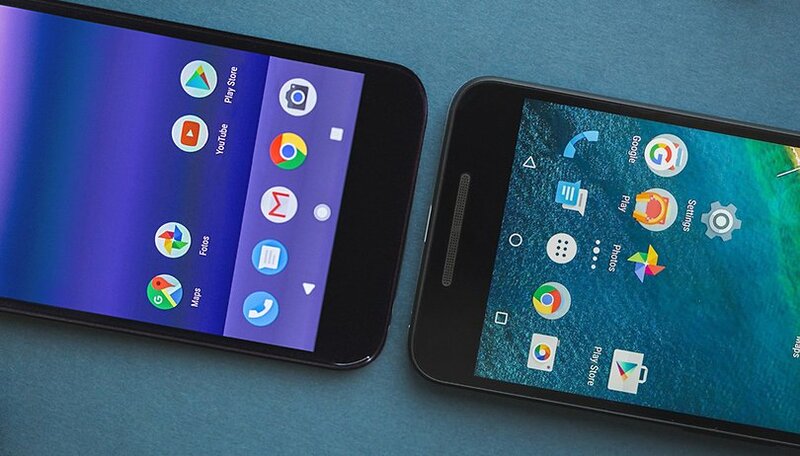 What I want to have on the Nexus, but cannot have, is the Pixel Launcher. This looks much better than the old Now Launcher, offers breathtaking animations and – on the Pixel, anyway – ingenious live backgrounds, which I last saw ten years ago on a Macbook Pro. As a cruel joke it would seem, the Play Store ID is still com.google.android.apps.nexuslauncher, even though you cannot install it on Nexus devices. Of course, the Pixel Launcher can also be downloaded and installed as an APK file, but that should not be necessary. Why is Google shutting out its most curious customers (i.e., the Nexus users)? Without the Assistant or a Pixel Launcher, testing Nougat is no fun. And with the expectation that Samsung is revamping its S Voice with the help of Viv, it becomes even more odd to have Nougat stand so far apart from its predecessor as a smartphone operating system. Of course, all of this applies only to devices that upgrade from Android Marshmallow to Nougat. New devices have Nougat to thank for the added value of fast start up times through smarter encryption and seamless updates. There are still a number of features that Android urgently needs to improve. It's still missing a backup feature, which all app developers cling to. I shouldn't have to set up my apps completely from scratch each time get a new phone. And – regardless of Android as an operating system – Google really needs to sort out its Play Store. There's still a lot of fake promotional garbage, which has not been examined and erased despite the conspicuously typical five-to-one-star evaluation system. Even Microsoft has cleaned up its meager store. Thanks to monthly security updates, the Nougat update has become effectively dispensable. Prior to August 2015, one of the decisive arguments for rapid provision of new Android versions was the security of your data. But then a security firm forced the hand of Google and other smartphone manufacturers and suddenly there was a fast and reliable stream of patches for known security gaps. These have been provided monthly since then and are theoretically available even for devices with Android 5.0 Lollipop. This means that your Marshmallow smartphone can remain secure without the almost-worthless Nougat update, as long as the Marshmallow-based fixes keep coming. Good writeup for driving Google improve more, but it seems overly underrates Nougat's features. Extended Dose, quick app switching, Split screen, a refurbished notification and quick toggle... exactly that's what I've wanted! But will all phones who get the Nougat update be able to use that cool split window function? That's honestly the only reason I want Android 7.0 on my phone. You can't complain... I bought wife the pixel, having forcing her to switch from her note 4. She didn't like it at first. Didn't like color and smaller screen. But using it almost a month now she says its better than any of previous Samsung's . It updates faster, lasts longer on a charge, is easier to use and easy to use in comparison. Plus they give you unlimited photo and video backups into Google only available to pixel users. That alone justifies the extra price of the device knowing you'll never need more memory for someone who takes lots of pictures. I personally won't go back to Google after getting a ZenFone 3 even after comparing the 2 side by side. So I say if you want updates don't complain, I was mad seeing Samsung owners getting updates before my nexus 6 did, and you're complaining not getting full updates not intended for an older version? I own a Galaxy S3 and have the latest Nougat 7.1 installed, with all features working out of the box! You couldn't possibly care about getting the latest software updates if you didn't purchase a Pixel or Nexus. IMO, no one who chooses to buy cellphones from OEMs other than Google or Apple have the right to complain about getting a timely update. It's obvious that those users have chosen bells and whistles over a stock experience. You will never be able to have all of those bells and whistles and timely updates if Apple or Google didn't offer them with stock software. FACT! Well, the advantage of a non Google Android phone is only if you are ready to void warranty and unlock your bootloader. That's the only way to get the latest OS on a less expensive phone. The writer owns a Nexus Phone, but Google decided to reserve the coolest Nougat features for Pixel phones only. Learn how to read.